the United Nations on the issue of the environment. 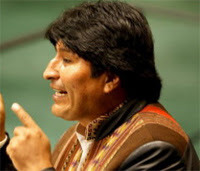 There is a reasonable debate, I would like to write about at some point, as to how much this environmentally conscious, anti-capitalist stance is reflected in practice within the Bolivian administration’s policies, but nevertheless this short piece was I am sure one of the best speeches made at the UN. In my view, it cuts to the core of the problem we face: that development in its current format is destroying the planet and can not be tampered with but needs radical change. have contributed 70% of the emissions of CO2. 2005 was the hottest year in the last one thousand years on this planet.